Spike has an uncanny ability to survive anything. Last time, we talked about Macross Plus, a movie that Watanabe Shinichiro made early on in his career. Now, we can see what he could do in about six years. Enter Knockin’ on Heaven’s Door (劇場版 カウボーイビバップ 天国の扉 Gekijōban Kaubōi Bibappu: Tengoku no Tobira, also known as Cowboy Bebop: The Movie), the movie that goes along with the wildly successful series Cowboy Bebop. Knockin’ on Heaven’s Door follows Spike, Jet, Faye, Ed, and Ein as they track down the terrorist Vincent Volaju in their latest attempt to get some money to fill their often empty stomachs. While the plot itself is largely independent of the series, the movie does assume that the viewer has seen the series and thus is familiar with the characters. Because of that, it wastes little time with character introductions and jumps right into the plot. Despite that, Knockin’ on Heaven’s Door featured a terrific story with great pacing, and most of my praise gets directed to the construction of the villain Vincent. Vincent is, for lack of a better way to describe him, completely insane and has no qualms about causing massive death. His goal is to unleash a biological weapon in the midst of a city as it celebrates Halloween. Despite everything, it is difficult to really describe him as “evil” as opposed to simply having no concept of right and wrong. Vincent could easily have been a 1-dimensional terrorist, but Knockin’ on Heaven’s Door built him up into a complete character as well. With the main cast, however, I reiterate that the movie assumes prior familiarity. Thus, I felt the movie really only bothered exploring Spike. The rest of the Bebop’s crew get their fair share of time on screen, but the movie was largely focused on what went on in the heads of Spike and Vincent. Had Knockin’ on Heaven’s Door been a standalone movie, this would have been really problematic, but it benefits from having a very solid foundation from a very solid series. Needless to say, this Watanabe-directed feature had absolutely insane presentation. Cowboy Bebop was a very well-animated series to begin with, but the movie’s visuals were easily on par with a Miyazaki film. The character designs are a bit more detailed than they are in the series. Watanabe once again made use of his handheld-style camera as Spike fights throughout the movie. Watching Spike fight is always a pleasure. He moves with shear fluidity, and the camera knows exactly how to handle him. The movie used computer graphics pretty liberally, but it all seamlessly meshed with the traditional hand animation, which resulted in a real treat for the eyes. As far as the music, I only need to mention that it is yet another Kanno Yoko score. Knockin’ on Heaven’s Door could easily have copped out and recycled tunes from the series, but Kanno wrote a brand new soundtrack. Jazz fans will not be disappointed. The voice cast of the series, including seasoned veterans Yamadera Koichi (Spike), Ishizuka Unsho (Jet), and the great Hayashibara Megumi (Faye), reprise their respective roles from the series and once again turn in terrific performances. Isobe Tsutomu does not have a lot of famous roles on his resume, but I was seriously impressed by his performance as Vincent as I was with Kobayashi Ai’s voicing of Electra. 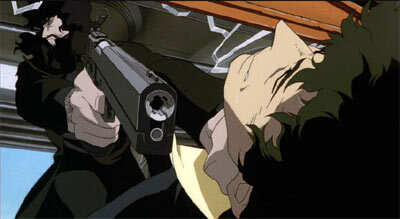 Ultimately, Knockin’ on Heaven’s Door is a movie that will not fail to impress fans of Cowboy Bebop. The main thing going against the movie is that people who have not seen the series will get little out of the movie. Still, I personally felt it was a terrific movie that goes along with a terrific series made with some of the greatest talent the anime industry has to offer and thus Knockin’ on Heaven’s Door makes its way to the Wall of Fame without trouble. It was great to see where the likes of Watanabe Shinichiro and Kanno Yoko have grown in the years since Macross Plus.